Sedes sacerdotis celebrantis debet munus eius praesidendi coetui atque orationem dirigendi significare. The chair of the Priest Celebrant must signify his function of presiding over the gathering and of directing the prayer. Presiding in the liturgical assembly and directing the prayer are understood within the larger context of the divine-human exchange in the liturgical encounter. The image of the doubting Thomas by Caravaggio expresses well the self-manifestation of the resurrected Christ to Thomas, and of the repsponse of Thomas who pierces the side of Christ in the painting. The theology of Irenaeus of Lyon of the two hands of God in creation, the Word and the Spirit, resonate with the two hands of Christ in the painting of Caravaggio, which are themselves an image of the two gift-services of the one presiding in the liturgical assembly and directing the prayer, which are placed at the service of the self-manifestation of the Word and the response of the assembly in the Spirit. The body of this thesis, then, traces the historical development of the use of the presidential chair. To this end, I have discerned two models for the chair’s use in Christian antiquity. The presidential chair is placed behind the altar, at the head of the apse, in the papal practice presented in the Ordo Romanus Primus from c. 700, and in the presbyteral practice found in the Gelasian Sacramentary, composed sometime between 628 and 715 for presbyteral use in the titular churches of Rome, and, subsequently, in the various eighth century gelasian sacramentaries widely diffused in Gaul and among the Germanic peoples. When the Pope was unable to preside at a papal liturgy, the substitute, whether bishop or presbyter, sat in a chair located to the right side of the altar, as described in the Ordo Romanus 2 composed shortly after 701 and very many liturgical books thereafter. 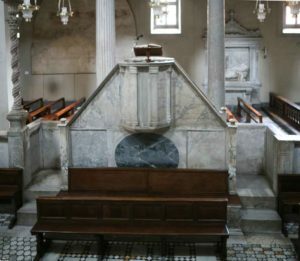 I document the eclipse of the episcopal and presbyteral arrangement of the chair behind the altar, and the eventual predominance of the chair to the right side of the altar, even to the point that a bishop in his own cathedral would sit in a chair to the right side of the altar as if substituting for the absent Pope. I document the recover of the use of the presidential chair beginning in the Pian reform of Holy Week in 1951 where it is associated with the ministerial diversity of the liturgical assembly. The reform of Holy Week prepared for the liturgical renewal mandated by the Second Vatican Council (1962-1965). I trace the discussions in preparation for and during the council and in the subsequent liturgical reform. These discussions are provided in Latin for the first time with English translations intended to give the reader direct access to the original Latin expression of the author. As the fiftieth anniversary of the Second Vatican Council has recently past, direct access to the discussions that made up the council provides depth of understand of the documents eventually promulgated. In these discussions I have discerned two distinct uses of the presidential chair. Discussions on sacred art focused on furniture as objects of art used in liturgy and the underlying rationale given presented the image of the community gathered by hierarchical offices around a central altar, as the social coordinate of arranging furniture. This discussion is the basis of the presentation on the arrangement of churches for liturgy in chapter five of the General Instruction of the Roman Missal (IGMR). The discussions on the renewal of the liturgy, however, produced a renewed Ordo missae which has as its basis the two parts of the liturgy, each with a corresponding, distinct place of celebration, the liturgy of the word at the chairs and ambo, and the eucharistic part at the altar. When the Ordo missae was published, however, it did not have its own pastoral instruction that presented the two-part principle upon which the celebration of mass itself is based. I discovered that when a community renovates or builds a church bsed on chapter five of the IGMR, they very likely will arrange the church for a celebration of the liturgy, which presumes a different arrangement. Rather one might recover the two-part structure of liturgy from articles 27 and 28 found in chapter two on the structure of the mass in the same IGMR so that a church might be arranged in a way consistent with the very structure of the liturgy celebrated therein. During the decade following the conclusion of the original thesis, I developed the material considerably. The discussions during the Second Vatican Council also concerned the prominence of the word of God in the liturgical assembly along with the renewal of the lectionary. From these discussions there arose the image of the two tables, or a double table, or one table both of the word of God and the eucharistic banquet. These images remain in the conciliar documents, and have been realised in stone in some churches built after the council in which the altar is designed as a table and another smaller table of the same design holds the lectionary as a table of the word. My response to the two-table arrangement is drawn in part from the discussion during the council on liturgy during which one bishop pointed out that the altar is a true table because the eucharistic banquet is celebrated there, but the table of the word is a table only metaphorically, which might diminish the truth of the Lord’s presence both in word and especially in the eucharistic sacrament. Rather, I prefer to turn to the recovery of the ambo tradition developed by Prof. Crispino Valenziano to develop a symbolic ritual proper to the proclamation of the word of God. Also from Prof. Valenziano I have received the three-part ritual arrangement for a church that adds the baptistry with its font to the assembly hall with its ambo culminating at the dias with its altar and ciborium. In my critical commentary that accompanies the illustrations in chapter twenty-six, I have also included some references to the pastoral desire that the minister turn toward the people to exercise one’s ministry or that the priest face ad orientem, “toward the East”. I also comment on the development of the centre-thrust stage that forms a piazza type sanctuary which contains the altar, ambo and chair. Some reference is also given to the development of the Communio räume, “Communion space”. One small volume written on the pastoral level has already been published in this series; it is: Come into the Light: Church interiors for the celebration of liturgy. Now the present volume provides the historical and theoretical research which underlies my presentations given during two Liturgy Weeks Architecture for Liturgy. Those presentations are being prepared for publication in two volumes that present my own synthesis of architecture with arts for liturgy, which I call the ritual model. 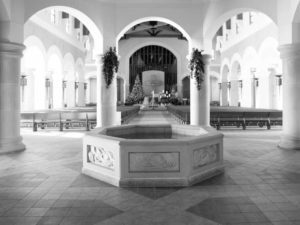 Just as the liturgical renewal was organic, a similar vision is needed for the renewal of architecture with arts for the celebration of liturgy. The ritual model, then, is organic in that it intends to present a systemic, unitary, comprehensive vision, as of an organism in all its parts and structures. The ritual model is being developed in collaboration with the Liturgy Institute London and the Pontifical Liturgy Institute, Rome, in order to promote ongoing discussion, teaching and publishing in the interdisciplinary field of liturgical art and architecture for the celebration of liturgy. 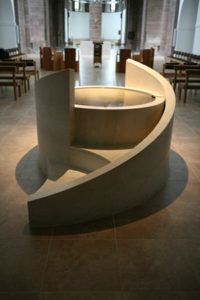 The ritual model is based first on the three primacies developed by Prof. Crispino Valenziano: personal illumination in the light of the baptistery celebrated at the font, ongoing maturation at the word proclaimed from the ambo in the assembly hall, interpersonal communion in the meal shared at the table-ciborium on its dais. Second the ritual model is based on the results of this research and on the many principles that arose from the study of history and during the discussions preparing for, during and in implementing the Second Vatican Council. Third the ritual model is based on the three interpretative keys developed from the work of Prof. Renato De Zan and further developed by Dom James Leachman and me for a course I teach in liturgical hermeneutics. The four interpretative keys suggest that liturgy is celebrated here and now, personally and actively. These same four keys may be expressed in more technical language as several sets of pairs: memorial (anamnesis, commemorare) and imitation (mimesis, imitare), presentation (prosforesis, offerre) and invocation (epiclesis, invocare), the fulfilling (eschatology) and moral behavour (conversatio morum), sharing divine life (theosis, sanctificari). The research presented here on the two-part place of celebration is based on the two-part structure of the Ordo missae, has convienced me that the architecture and arts of a church must be based on the bodily actions that narrate the mysteries celebrated in liturgy. Not only does this bodily narration determine the functional aspects of church design, but even more importantly the inner dimensions inherent in the ritual narrative are expressed outwardly through an artistic program well integrated into the architectural design and arrangement of churches. While much attention has been given to the design of functional and even transcendent buildings, insufficient attention has been given to the prolonged ritual narration whose every element expresses in synthesis the whole mystery celebrated by rites, symbols and texts proper to each element, all of which is determinative of the design and arrangement of church buildings and their artistic programs. These publications, teaching and conversations are intended to support church officials who govern the building and renovating of churches and developing their artistic programmes, as well as professional artists and architects wishing to design buildings and works of art that support a fuller ritual narrative and better express outwardly elements inherent in the ritual celebration, and also parishes wishing to renew their liturgical celebrations by supporting a more fully developed ritual narrative through a more fully developed architectural and artistic environment. IGMR nº 310, in MR 3em2008, 70. GIRM nº 310, in General Instruction of the Roman Missal, ed. Catholic Bishops’ Conference of England and Wales, Catholic Truth Society, London 2010 (GIRM). C. Vogel, Medieval Liturgy: An Introduction to the Sources, tr. and rev. W. Storey, N. Rasmussen, (NPM Studies in church Music and Liturgy), Pastoral Press, Washington, D.C. 1986, 155-160 (tr. and rev. of Introduction aux sources de l’histoire du culte chrétien au moyen âge, Centro italiano di studi sull’alto medioevo, Spoleto 1981). Liber sacramentorum romanae aeclesiae ordinis anni circuli (Cod. Vat. Reg. lat. 316/Paris Bibl. Nat. 7193, 41/56) (Sacramentarium Gelasianum), ed. L.C. Mohlberg – L. Eizenhöfer – P. Siffrin, (Rerum ecclesiasticarum documenta, Series maior, Fontes 4), Herder, Roma 1960. Ordo II, in Les Ordines Romani du haut moyen âge, ed. M. Andrieu (Spicilegium sacrum lovaniense. Études et documents 23) Spicilegium sacrum lovaniense, Leuven 1971, 2, 109-116. D.P. McCarthy – J.L. 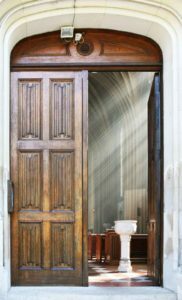 Leachman, Come into the Light: Church interiors for the celebration of liturgy (Documenta rerum ecclesiasticarum instaurata, Liturgiam provehens architectura : Architecture Promoting Liturgy 1), Canterbury Press – The Tablet, Norwich 2016.